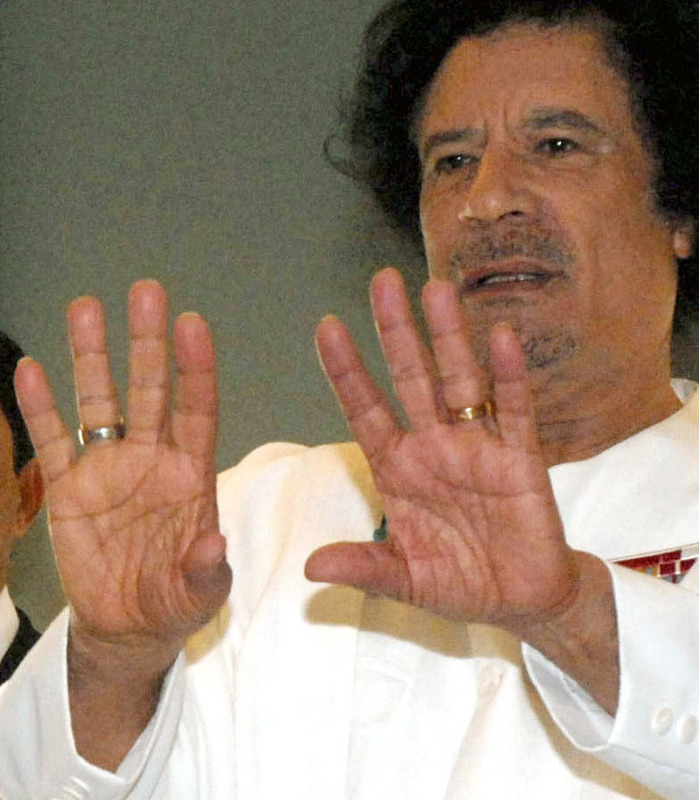 COLONEL GADDAFI - Into the hands of Lybia's former leader! Muammar Abu Minyar al-Gaddafi1 (Arabic: معمر القذافي‎ audio (help·info) Mu‘ammar al-Qaḏḏāfī; also known simply as Colonel Gaddafi; born 7 June 1942) has been the de facto leader of Libya since a coup in 1969. From 1972, when Gaddafi relinquished the title of prime minister, he has been accorded the honorifics "Guide of the First of September Great Revolution of the Socialist People's Libyan Arab Jamahiriya" or "Brotherly Leader and Guide of the Revolution" in government statements and the official press.With the death of Omar Bongo of Gabon on 8 June 2009, he became the longest serving of all current non-royal national leaders. He is also the longest-serving ruler of Libya since Ali Pasha Al Karamanli, who ruled between 1754 and 1795. Re: COLONEL GADDAFI - Into the hands of Lybia's former leader! Very good palm photos of Colonel Gaddafi Just three days before I was thinking of him. He is a ruler with good luck because he is attempted to kill several times. Dear and respectable Upendra Singh. thank you for the pictures. They really have a good quality. Generally, I am not a fan of readings from photos of hands. A palmprint shows so much more detail! This is an obvious exception and a BIG one at that. One of the photos here is so clear and so graphic that it honestly took my breath away! Wow, what a hand! I could write a book on it! The lines look like they have been chiseled with a sharp knife! Thanks a MILLION for posting this!!!!!!!!!!!!!!!!!!! Without qualification, this is one of the best hand photos I have ever seen! The lines/hand tell sooooo many stories! I am totally blown away, to say the least. Gaddafi has been an enigmatic, mercurial character on world's stage for decades and now I see why! Yes, the hand reveals everything!!! In a few days, I will post a detailed analysis of this famous person's hand. Please predict whether Gaddafi will also fall over the coming months? first of all: Western chirologists usually don't do any predictions. Secondary - if I would be a true Gipsy palmist - I would say, that it is hard and often not very precise if I should look before around the 20th year and after the 60th year, because then we often miss important correspondence signs. In the meantime I found out that whether the birth year nor the birth date is really shure. Under this condition I would only say, that around his 73-74-75th are critically years. for taking the trouble to reply. You are right, it is too much to expect palmists to predict actual events. ...thanks Martijn, what a good impression of the spatula right Ring finger and the expressive upper Mercury phalanx. caledonia wrote: Please predict whether Gaddafi will also fall over the coming months? Also Gaddafi's (former) friend Berlusconi has minutes ago declared that he now (suddenly) condems Gaddafi's violent responce (today with bombings on the Lybian population) to the demonstrations in Lybia - after Berlusconi had actually expressed his support for Gaddafi's actions yesterday. And there are rumours (from British officials) that Gaddafi has left Lybia by airplane (possibly ahead to his friend Hugo Chávez in Venezuela - though officials from Venezuela said that Gaddafi is still in Lybia). Is Gaddafi still Lybia's leader? UPDATE 1: New rumours now say that Al Arabiya has reported that Gaddafi has planned to speech on state TV... within minutes??? I still have doubts that Gaddafi's common known birth date and age is right - he even looks older than 68. - Usually we find the birth datas: *19th June 1942 near Surt/Libya. - Today I found another and as I think may be more interesting: *7th June 1942 near Surt/Libya. During his 'revolutionary speach' one could only see the picture above: the left hand 'crushing' a USA-aeroplane. A side-effect of the international intervention that started today in Libya, is that Gaddafi might now no longer be able to present himself publicly in a lengthy LIVE speach... because that could result in a real Tomahawk ending up within the reach of his left hand. Anyway, I regret how the war in Iraq and Afghanistan started a few years ago (and I was very happy that my country decided to leave Afghanistan last year)... but I can fully support the intervention in Libya today. ... Just to avoid that Gaddafi continues attacking his own people. I undestand your meaning, but I can't remember that war actions did bring any really result during the last years, though it would be god in this case. Astrologically it was a bad time to start a fight, though there was a need. The Mars is in Pisces and Saturn retrograde what means that the fighting forces are weak or diffuse in any kind and the end of the whole operation will delay itself. I am not sure about Qaddafi's date of birth. In the middle of WW2, born in a tent in the desert? Would anyone in the camp have any idea what the date was ? I looked in my Britannica, and no date was given. If the date is not in those books, my guess is no one knows. It might now be a little bit hard to imagine, but in the 70's... Muammar Abu Minyar al-Gaddafi was actually known as a 'charming young man'. I trust my books (Britannica) more than Wikapedia. So I believe Qaddafi's DOB to be unknown. On a quick look at his hands i do not think he will be dead anytime soon. However it does look like when he does die it will be sudden. His hands say he is not mad, quite the oppersite i would say. Bit of a player. He has the hands i would expect to see in a tribal leader. Strong, powerful, and determined, but not suisidal. I would not be surprised if he was looking for a way out of Libya. Before seeing the photos of his hands i had him down as dead, But now I could belive he will do a runner when its clear to him that the game is up. I received your PM but it is against the forum rules to answer questions like this. The idea is that everyone should be able to read all the comments, therefore gain knowledge. I will answer here what you asked. The line going up from Gaddafi's life line is an effort line, but being so long and strong it looks like a first fate line. The one coming from the life line based on his background an family life the other his own ideas of things. About his date of birth I have just looked up and encyclopedia and it gives the year 1942. they do not give day or month for anyone just the year.